The aim of this paper was to investigate the impact of a toll-free hotline and mobile messaging service on care-seeking behaviors. Due to the low uptake of the services, the treatment on the treated estimate is used. For maternal health, the intervention had a strong, positive impact on antenatal care initiation and skilled birth attendance. 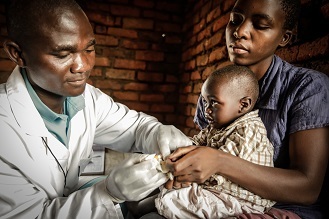 No effect was observed for postnatal check-ups, receiving the recommended four antenatal care visits and vitamin A uptake. A negative effect was observed on tetanus toxoid coverage. For child health, no change was seen in child immunization, and a significant decrease was observed for care-seeking for children with fever. Different factors are associated with care-seeking, which may explain in part the variations seen across care-seeking behaviors and possible influence of exogenous factors. 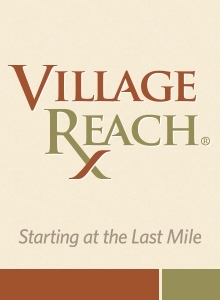 Introduction of mHealth services for demand generation require attention. 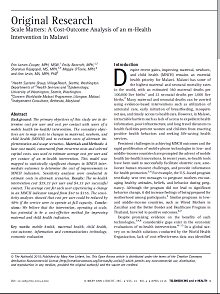 Despite promising evidence on the benefits of such mHealth technologies, considerable gaps exist in the economic evaluations of m-health interventions. In a global survey on m-health solutions conducted by the World Health Organization, lack of cost-effectiveness data was identified. In order to strengthen the knowledge base for the assessment of m-health technology, the authors have undertaken a cost outcome analysis of an m-health intervention.Published in the Journal of Telemedicine and eHealth, the primary objectives of this study are to determine cost per user and cost per contact with users of a mobile health (m-health) intervention. Authors: Larsen-Cooper Erin, Bancroft Emily, Rajagopal Sharanya, O’Toole Maggie, and Levin Ann. 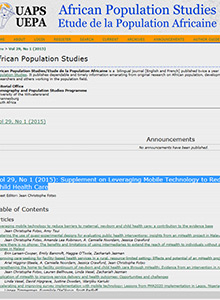 Study Published in African Population Studies Vol 29, No 1 (2015): Supplement on Leveraging Mobile Technology to Reduce Barriers to Maternal, Newborn And Child Health Care. 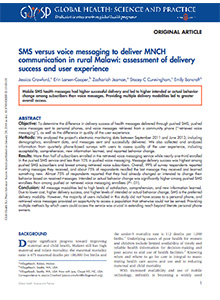 The purpose of this study is to identify the benefits and limitations associated with intermediaries to provide access to and increase utilization of an mHealth intervention amongst people without personal phones in Balaka District, Malawi. A mixed-methods approach was utilized including quantitative data on usage and focus groups and interviews with users and volunteers. Community volunteers equipped with mobile phones served as intermediaries and were critical access points to the service for users without personal phones.